Assignment for readers: Look at the above paintings for a couple of minutes. And then mention in the comments section on what you feel. What comes to your mind? What do you imagine? It could be some thing, some emotion, anything. Meet Samatha Sharma, the Indian artist/painter who creates art in the ‘Abstract Expressionism’ genre. 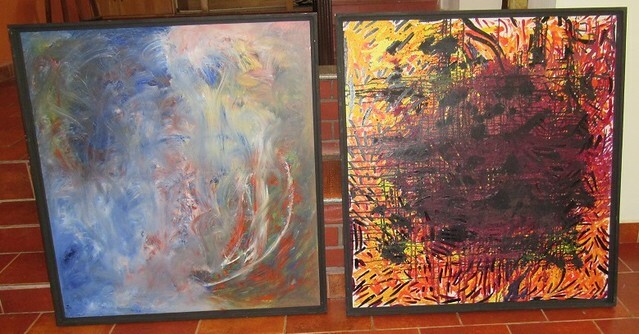 These paintings are by her, and is a part of Movement series. In India, we are exposed to art that is based on a form — some person, some object, some action, some thing. But there could also be art that is formless. Abstract Expressionism is a genre that seeks to get out of the idea that art needs to be based on objects (or) art needs to have a form. I know it’s difficult to accept something like that, especially with the kind of art/paintings we are exposed to, here. Initially, when I looked at the paintings, I couldn’t figure out anything. But eventually, when I kept looking at it, the art elicited certain emotions out of me. I was, of course, thinking in terms of forms — any objects that some corner of the painting reminded me, but at the end of the day, after being exposed to multiple paintings in the same genre, I realized form is not required to connect emotionally with art. For instance, certain colors make us feel in a certain way, don’t they? So, are you ready to give your answers for the assignment? There is no right or wrong, just tell us what you felt. Here’s the artist’s email address if you want to connect/have a look at the paintings: samatha.express[at]gmail.com. Sorry, i couldn’t come to a conclusion what i felt really… but there’s something inspiring to keep alive emotions. The first one gives me an impression of nature and life in forest and the second one relevant to people and devastation. These are great paintings. Hope you got permission to blog about them. Cartooning is also a great art. Some like RKL can be so good. I don’t get any idea. First one expressing a confused mind meddled among hues. Second trying to shape the confusion. Good, you are close. I think there are no ‘right’ or ‘wrong’ interpretations, as these can be subjective to the person who sees the paintings. I am familiar with the genre. The first painting invokes higher thoughts, dreams. The second one, dark thoughts, turbulence. A turbulence without a solution, something fixed, immutable. Without any disrespect to the artist, it did not evoke any emotion in me. 🙁 I don’t really like abstract art in general, as I feel you don’t really need any skill/talent to paint random strokes with a brush. I guess it’s not that random, there is a purpose behind that painting, but it doesn’t have a form. That’s OK, I guess it will evoke an emotion in you in the future. This painting style is quite popular in the West. The first painting is a pleasant scenery , where a boat is sailing on a river , with lush trees on either side of the river and the scene looked very pleasing. The second painting, for me, is a forest fire, burning down the whole forest.